Find out the most recent autism statistics including prevalence and comparison of rates to other disorders. Over the past decade, statistics are showing a rise in all different parts of the spectrum for no officially known reason. Because autism causes are more theoretical than fact at this point, there may continue to be an increase in prevalence until more studies can be conducted. It’s possible that the increase may likely be contributed to more awareness and the wide range of characteristics that are involved in the diagnostic criteria. It then increased to two to six cases per 1,000 or between 1 in 500 to 1 in 166. Recently in 2009 the U.S. Centers for Disease Controlrevised the autism prevalence rate to a staggering one in 110 children. Males are more likely to be affected than females with a ratio of 4.3:1. Currently there are approximately 1 in 500 (2/1,000) to 1 in 166 children (6/1,000) that have autism. In the United States, the prevalence of autism is a staggering 1 in 68! This is almost unbelievable and really demonstrates our need to determine not only a cause, but good treatments as well. Statistics when compared to other childhood disabilities show that autism rates (3.4/1000 children) are lower than mental retardation (9.7/1000 children) and higher than the rate of cerebral palsy (2.8/1000 children) (2). Around 17 percent of children are diagnosed with some type of developmental disability, including conditions that are considered more mild, such as ADHD, learning disabilities, and speech and language disorders making them more common than autistic disorder. It would depend on the diagnosing physician and what test or checklist was used to make the diagnosis. It’s important to note when considering statistics that it may not be a full population count of all individuals that are diagnosed. There may be some children that are diagnosed, but that may actually have Fragile X Syndrome, or Childhood Disintegrative Disorder, as the symptoms can be very similar. Another contributing factor to the reported statistics, that may not be accounted for, are the children that are stated to have recovered. This has been shown for some children that participate in intensive ABA therapy or more specifically discrete trial training. There have also been promising advances in the use of biomedical treatments for autistic behavior, such as those outlined in the book Healing the New Childhood Epidemics, which I highly recommend all parents reading. 1. 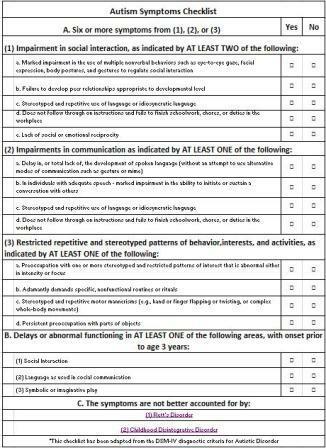 Characteristics for Autism.(2008). www.autism-society.org. 11-20-09. 2. Schoenstadt, A. (2009). Autism Statistics. www.autism.emedtv.com. 2-16-10.